Richard E Fulwiler, managed to obtain permission to re publish this article for the site, from Flying magazine managing editor Connie Sue White.....thanks Connie. Following is the complete transcription of the March 1961 Flying magazine article including scanned images ( will be sent separately ) on the then new On Mark Marksman prototype, N100Y. Realize that the Marksman specifications listed had not yet been finalized by On Mark at the time of the writing. The text is complete and exactly as originally presented ( any grammatical errors included ). Permission to use and publish on your site comes from Connie Sue White, Managing Editor, Flying magazine with the condition that it is shown in the original format and with the included statement “ As seen in Flying magazine, March 1961 “ . foot seven-inch nose section houses radome , baggage. On Mark’s executive conversion of the rugged B-26 links speed, range, and full pressurization. RUGGED, versatile and popular, executive conversions of the World War II Douglas B-26 have taken a new lease on life. Addition of pressurized cabins for over-the-weather flying tops off the airplane’s already proven performance, safety and economic capabilities. Leading in conversions of the B-26 with 48 of the bombers converted into the unpressurized Marketeer, is On Mark Engineering Co. of Van Nuys, Calif., whose new pressurized version, the Marksman, showed an excellent rate of climb and high cruise speeds during evaluation by FLYING. Although originally designed as a low-level ground attack bomber, the aircraft handles well at altitude. The airplane was taken off from Van Nuys at approximately 30,000 pounds gross weight and flown in a typical business flight en route profile straight to altitude under timed conditions. The Marksman reached 11,500 feet msl in eight minutes after liftoff; 16,000 feet msl in 12 minutes and 20,000 feet msl just 16.5 minutes after liftoff. It was then climbed to 24,900 feet msl, its service ceiling. The aircraft used in evaluation was a prototype Marksman, N100Y, in which the cabin altitude controller was set for 4.16 psi differential and held a cabin altitude of 10,500 feet at 24,900 feet density altitude. Design structural differential is 4.67 psi, and future production Marksman will have the controller set to this value, yielding an even lower cabin altitude. The airplane has a 7,500-foot cabin altitude altitude at 20,000 feet, even with the lower differential. 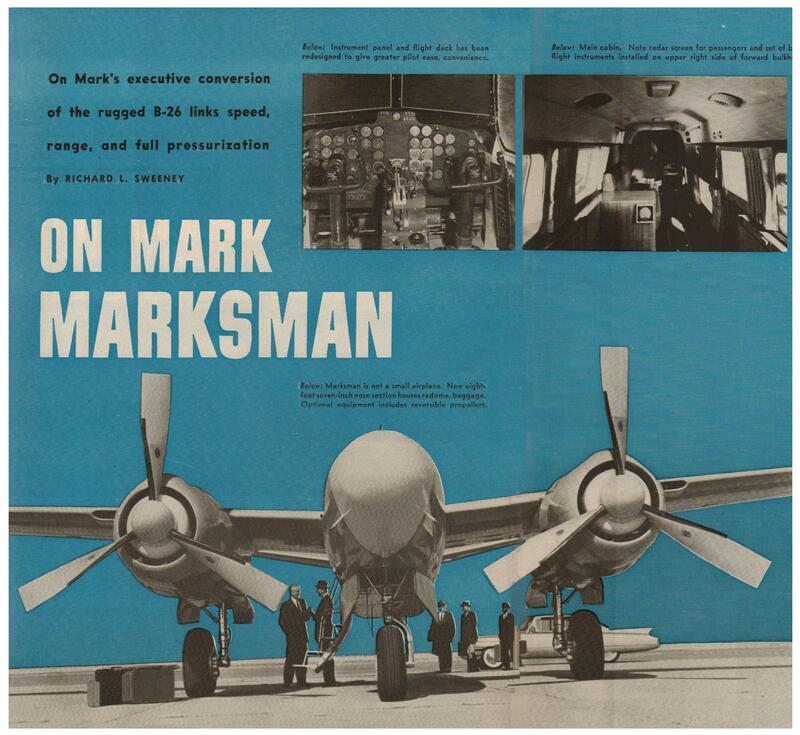 The Marksman uses a Stratos cabin supercharger, heat exchanger, and associated hardware, in combination with an AiResearch cabin altitude controller unit, essentially the same combination as in the Convair 440 transport. After reaching service ceiling, the Marksman was allowed to settle to 24,600 feet where flight conditions were stabilized to approximate of the steady state of an en route business flight. In addition to the timed, straight-away climb to altitude and sampling of performance, the flight evaluation included stability and control tests at medium and low altitudes plus cruise speed checks at optimum altitudes, ILS, landings and takeoffs. On Mark offers the Marksman in three basic configurations. Primary differences in the three are the power packages and fuel capacities, since the customer has choice of three standard interiors offered which make no significant differences in price. A ) Standard 800-gallon fuel capacity and 2,000-hp R2800-75/79 engines with less then 350 hours SMOH ( essentially the military power plants ). Basic price is $257,430. B ) Wing tip tanks added, raising fuel capacity to 1,130 gallons, and R2800 83AM-4A engines ( zero time SMOH ) with Hamilton Standard 33-E-60 high activity propellers. Basic price is $314,475. C ) Additional internal wing fuel incorporated, raising total capacity to 1,330 gallons, R2800-CB-16/17 Engines at 2,400 and 2,500 hp respectively with water methanol injection, zero time SMOH, and Hamilton Standard reversible 43-E-60 high activity propellers. All specifications include a remanufactured aft section eliminating the wing spar inside the fuselage; the side, hydraulically operated self-contained entrance door-stair; large DC-7 type windows; a new 103-inch nose section for baggage and radar; dual controls and new instrument panel; Ceconite control surface covering; the interior choice and the customer’s own custom exterior paint. Not included are the communications-navigation equipment where customer wishes vary extremely widely. The Marketeer was certificated with the Sperry A-12 and Collins AD 101 autopilots, the RCA AVQ-50, Bendix and Collins weather avoidance radars. The same equipment will be optional offers for the pressurized Marksman. On Mark says it has been given data by one operator of a fleet of B-26s which shows operational costs of 62 cents per aircraft-mile based on 360 hours per year aircraft utilization, less depreciation. Since costing can be figured in many ways, On Mark says it feels this is a valid figure for the unpressurized airplanes, and calculates that on the same basis, a cost of 68 cents per airplane-mile should be reasonable for the pressurized version. Since the Marksman is based on the military B-26, the basic FAA-approved flight manual is Air Force technical order 1B-26B-1. This is referenced in On Mark’s flight manual as the applicable original source ( one T.O. goes with every plane ), with the On Mark publication spelling out those areas of difference which arise from the company’s modifications to the aircraft. Flight techniques used with the Marksman are quite ordinary. Rotation on takeoff is around 130 mph IAS; second segment climb speed is about 155 mph and while en route climb speed of 190 mph IAS was the original value, On Mark chief pilot James Siberell uses 250 mph IAS. This, after building up, yields approximately the same rates of climb as the lower figure but gives better horizontal distance. The 250 mph climb speed was used during FLYING’s evaluation. Speed checks with the Marksman were made at high gross weights, without allowing the airplane the time to accelerate as during a typical flight, yet values recorded in all instances were extremely close to specification, with variations accounted for by temperature conditions on the day of the flight. At 23,000 feet the aircraft recorded a true airspeed of 369 mph after only five minutes of flight at that altitude to achieve a stabilized condition. In descent to this altitude from 24,600 feet, the aircraft was held to 240 mph IAS or less. Initial airspeed at high altitude after stabilization from climb, and a recheck some seven minutes later showed a speed buildup rate at the aircraft’s service ceiling of two mph per min. Engine-out stability and control was tested initially at 16,000 feet msl, just under the Marksman’s single-engine ceiling of 16,400 feet. At this altitude, the propeller on the right engine was feathered. Level and climbing turns as well as descents into and away from the dead engine were made and in all cases the airplane showed a high degree of stability and displayed excellent controllability. During feathering, the airplane easily was held against normal trim with medium control pressures, and no excess trim was required to return the airplane to hands-off condition. The Marksman did not tend to lose altitude, although only cruise power of 30 inches mp and 2,150 rpm was retained on the operating engine. During the ILS run the Marksman continued to show excellent stability and control with gear and 15 degrees of flaps down, airspeed held at about 150 mph IAS, over the 11-mile-long Burbank ILS glide path. On a second flight, the Marksman was kept at lower altitude ( 6,500 feet MSL ) for additional engine-out, stability and control testing. In approach configuration, gear and 15 degrees of flaps extended, the airplane was slowed to 120 mph IAS with the right engine in a zero thrust condition, when turns climbs and descents were performed. The aircraft was trimmed for normal straight and level flight at that airspeed and retrimmed for the zero thrust condition; all maneuvers were performed without additional trim compensation. Throughout the flights, the airplane exhibited the same stability and control characteristics. The most prominent difference was that it becomes somewhat more sensitive, especially in the longitudinal axis. With an ample spread between initial buffet warning and loss of lift in a stall, the Marksman maneuvers well without attaining severe attitudes. During initial climb at the heavy gross weight, attitude from the passenger cabin viewpoint was not excessively steep. Landing technique with the Marksman is completely straightforward for an aircraft of this weight and type; pattern is flown at approximately 150 mph, which is retained through final approach until landing is assured, after which power is cut and rotation is accomplished. No specific amount of flap is required, and should a short-stop landing become necessary, propeller reversing significantly shortens landing roll. Currently, the Marksman uses asymmetrical engine power plus brakes for steering; however a hydraulically steerable nose-wheel may be incorporated. ONE basic advantage of On Mark Engineering Co., according to President Robert O. Denny, lies in being the sole licensee for B-26 remanufacture and all spare parts manufacture. This gives the company access to all original Douglas drawings and engineering data on the airplane. 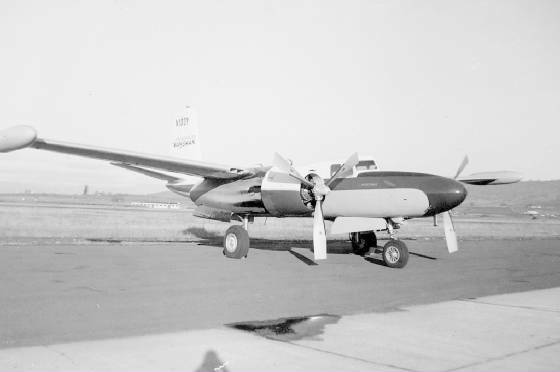 When On Mark was organized in 1954, Denny says, the company first reworked several B-26s, then some DC-3s, then returned to the B-26s and grew slowly as the business expanded. A start was made in 1954 toward refining the basic B-26s which were converted to executive aircraft. The company’s first customer was a private individual in Santa Barbara, Calif., the second a gold mining concern, and each airplane was slightly more refined than its predecessor. In 1956, Denny went to Douglas Aircraft Co., and the licensing agreement was set up which decided the major On Mark B-26 refinements such as eliminating the aft wing spar through the fuselage and using a heavy forged ring frame instead. When the Douglas drawings and data were obtained, On Mark knew what they had to do to match or exceed the original aircraft in all departments. By being the sole Douglas licensee, On Mark has obtained a standing Supplemental Type Certificate for the Marketeer and had to only flight test and recertificate those essential items changed by the pressurization, in order to obtain an addition to the STC for the Marksman, which has been granted on January 23 of this year. Since its inception, On Mark had only the Marketeer conversion, with several options offered in engines and fuel capacity as the Marksman offers today. With addition of the second model, Denny anticipates a majority if not all future business will be in pressurized airplanes. The Marketeer had a basic price approximating $200,000 which, with electronics and other custom equipment, brought the price of the company’s 48 conversions so far to about $300,000, some going as low as $225,000, some as high as $400,000. With three specifications offered for the Marksman, Denny anticipates the average price will be $375,000, since wide variations are preferred by customers in radar and associated more complex custom equipment. Presently, the Marksman is licensed under CAR Part 9. The only restriction is that the aircraft cannot be used to carry passengers for hire or for charter work; however, anyone who owns one can lease it. Concerning the future, Denny says he sees a long life yet for the B-26s, and there is an ample supply of the airplanes available on the open commercial market and others still in USAF storage. Basically, Denny says, On Mark is buying a proven set of wings, landing gear, tail group, and systems. Re- manufacture, modification and certification of a modified fuselage is the best technique in doing conversions, which has made possible the addition of the pressurized cabin and projected future improvements without extensive and costly changes and recertification. Next step after the pressurized Marksman, Denny declares, is a conversion to some form of turboprop power, and three engines now are being considered for a later date application. Although no moves are planned in that direction now, says Denny, he sees no reason why the turbine airplane should not sell for a basic price of less than $500,000. In addition, he says, engineering will be such that a retrofit will be possible for current B-26 users as well as Marketeer owners, with the progressive design for pressurization, then turbine power. Takeoff gross weight ............................................................... 35,000 lbs. Landing weight ........................................................................ 31,000 lbs. Empty weight .................................................................... 24 - 25,000 lbs. Useful load ....................................................................... 10 - 11,000 lbs. Wing span ( with tip tanks ) ..................................................... 71 ft. 6 in. Length ..................................................................................... 53 ft. 10 in. Height ....................................................................................... 18 ft. 6 in. “A“ - ( standard ) ....................................................................... 800 gal. “B“ - ( standard plus 165-gal. wing-tip tanks )........................ 1,130 gal. “C“- ( standard, wing-tip tanks and Pliocell int wing tanks.... 1,330 gal. Takeoff distance over 50 ft. ( 32,600 lbs. ) ................................. 3,495 ft.
Takeoff ground run ( 32,600 lbs. ) .............................................. 2,450 ft. Landing over 50 ft. ( without reversing props )........................... 3,000 ft.
Two-engine ceiling ..................................................................... 25,000 ft. Single-engine ceiling .................................................................. 16,400 ft.
Max. range, tip tanks & Pliocell wing tanks ( norm reserve )..... 2,500 mi. Normal range, tip tanks & Pliocell wing tanks ( norm reserve ). 2,100 mi. “A“ - ( per engine ) .............................................................. 80 gal./hr. “B“ & “C“ - ( per engine ) ................................................ 95 gal./hr.